This pdf clocks in at 17 pages, 1 page front cover, 1 page SRD, 1/2 page editorial, leaving us with 14.5 pages of content, so let’s take a look! All right – so you may know already that I *love* scifi/fantasy mash-up – but does this one work? Well, we’ll see! We begin with a limited armor special ability that is rather interesting: Self-charging armor functions for a number of hours equal to the enhancement bonus as if it possessed charges without consuming charges – this is limited and yet useful. Nice! The pdf also sports no less than 4 specific pieces of armor, beginning with the EMP armor, dealing reflexive damage when charged, doubled versus nanites. The living harness can either enhance the agility of the respective wearer, while also providing assistance in wielding larger melee weapons or stabilizing double firearm-wielders by granting the Two Weapon fighting feat when using them in conjunction with the living harness. The magnetic armor increases AC versus metallic weapons when charged, but interestingly makes it impossible to wield metal weapons while the armor is active. The subjective gravity suit, though, is quite frankly my favorite here – using the rules for subjective directional gravity, this one allows for the creation of whole new encounters/flexible aerial dungeon encounters. Love it! Similarly to the armor ability, weapons may also become self-charging, though here, the charges are tied directly to recharges per day – good to see the distinction between both being represented properly in the rules. The specific weapons provided include a pistol with an intriguing feature – when shooting at two different opponents in the same round with the semi-automatic feature, the gun generates an arc of lightning between them, provided they are no further than 30 ft. apart from each other, though that does expend +1 charge and only one such arc can be generated per round. Interesting, if a bit powerful. The Black Blade is basically a blacklight-ish laser torch that can damage invisible targets and nat. 20s can result in severed limbs. The chainsaw of carnage is per se cool – it can be activated by taking Con damage, with longer activation continuing to consume Con. Damaged creatures can be demoralized as an immediate action, though the Con-damage powering can be rather nasty for the rare creatures with a means to regain Con. I’d also like to know whether the weapon deals Cha-damage to undead etc., or whether it does not work for them – I assume the former, but am not 100% sure. The final specific weapon is a retriever-based autograpnel that not only has excellent pulling-capacity, but which can also be used to deal additional acid, cold or fire damage. The pdf also sports no less than 8 diverse magic items, which contain emergency rods that can produce limited spacesuits (1 x year) or panic suits (1/day). There is a battery that cannot be destroyed by recharging as well as an array of magitech grenades, codified by spell-level and caster level with fitting costs – and yes, these can deliver spells. Similarly, there are pseudointelligences in various iterations, repositories of knowledge that may be able to reply or follow instructions, but not truly learn – a clear case of “why hasn’t this been done before” – nice! There also are selective force fields and telepathic commsets. One battery can be recharged from the lifeforces of slain opponents (with a valid chance of failure to prevent abuse) and a battery that can be recharged via spells, again, with a significant destruction-chance to prevent abuse. Okay, this would be precisely the point when this pdf exceeds the expectations I had for it – expanding the base rules for animated vehicles pioneered in the excellent, massive Construct Companion and expands them with appropriate animated vehicle options for spaceships – yes, including rockets, force-fields and the like. And while more convenient with the Construct Companion, you can also use these for vanilla animated objects. A total of 3 fully statted such spaceships are provided…and yes, I’m so going to go all out, write some mythic options and make the friggin’ Lexx with these rules. Love them! Next up would be biotech, which includes an alternate trait to represent super-soldier programs and the like with an optional trait. The rules pretty much follow the cybertech rules with implantation values, sporting concise rules for the process of getting biotech implants and removing them as well as guidelines for the price usually charged for the implantation/removal procedures. There would be implants for becoming amphibious and implants that provide endure elements as well as reducing the requirement for sleep, water, food, etc. The memory enhancer can act as a spellbook substitute for prepared casters, allowing for preparation from memory. At 9K cost to create, this one is rather underpriced, considering that it takes away a crucial weakness of prepared casters reliant on spellbooks. The natural attack implant has a minor formatting glitch, depicting the header framed by red lines (like the construction-requirements) instead of the purple usual header. There also are variants of neural implants that grant 1/day SPs and different pheromones as well as a poison sac. There would also be biotech implants that duplicate degrees of fortification – and here, I would have really liked to know whether these add their chance to negate sneak attacks and critical hits as a separate chance to the effects of fortification -usually, I’d assume no, but since the biotech doesn’t explicitly state being based on fortification, I am quite frankly not sure. I also think that the Mark VI-version, which provides 100% critical hit/sneak immunity is severely underpriced at 24500 GP cost to create. Considering that this invalidates a series of builds completely and can’t be duplicated via vanilla magic, I think this one needs to die…or at least be significantly more expensive. There also would be vision-enhancers as well as 3 treatments, slotless gene therapies in effect. These stop aging, grant regeneration or modify the size category of the character. The formatting for these is a bit odd, with the first two not having the clear construction-separation, while the third does. Editing and formatting are very good, though not as precise as in some installments of this series. Layout adheres to the 2-column full-color standard for the series and the pdf comes fully bookmarked for your convenience. Artworks are nice and both full-color and b/w, though I saw one before. 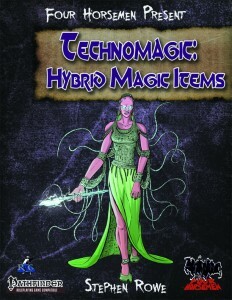 Stephen Rowe’s collection of science-fantasy technological/magic-hybrid items are unique and while some items herein are pretty powerful and require some careful consideration depending on the level of power you feature in your game, for the most part, this collection is interesting and well-executed and in vanilla-contexts, you probably won’t see rules-abuse here unless someone REALLY tries hard to break them, though that is not the fault of this pdf, but rather the consequence of the relatively wide-open type of option some of the items represent. I am pretty much a cynical guy who has probably read too many books for his own good – thus, particularly the biotech-chapter fell a bit flat for me personally. Feasible and covers the basics, but I really wished the concept had its own full book to shine and, more importantly, the space to explore more far-out biotech – what’s in here, is pretty much tame. On the other hand, however, the animated space ship-options clearly hit a very soft spot with me – I loved them and they rock and inspire. Similarly, the items contained in the beginning went a step beyond the expected and thankfully did not just retread the genre-defaults – kudos! But how to rate this? See, that is pretty difficult – there is a lot to love in this pdf and a couple of instances, where the concepts presented herein would have warranted their own books by virtue of their awesome ideas, there also are a few minor hiccups in the formatting and not all of the items herein reach this level….though many, in fact, do. Hence, my final verdict for this book will clock in at 4.5 stars, rounded up to 5.